GGPLOT2 is a package developed for producing graphics within the R statistical tool. It utilizes a layering metaphor for gradually adding visual details to the desired output. R can support datasets with millions of rows for various aggregation and analysis operations, but it can be slow, unwieldy to code in, and has memory limitations. 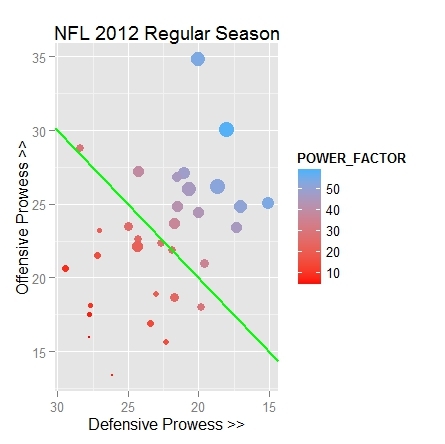 This article walks through the development of a complex scatter plot using NFL (American football) data. This dataset was developed in an earlier article, the gist of which can be viewed below (in an Oracle database). The rows in this table contain individual scores for all 256 games of the regular season, excluding the playoffs. The Oracle SQL below builds some useful aggregate stats off of this base data for each of the 32 teams in the NFL: average offense (points scored), average defense (points scored against), average victory (or defeat) margins, and some ranking info for each of these elements, and a constructed new element called ‘Power Factor’ which combines the defensive and offensive rankings into an overall efficiency rating. The results from the above query can be exported into R using SQL Developer‘s CSV output option. If preferred, one could use RODBC to open a connection between R and the database, if you don’t mind typing some complex SQL commands directly into the R environment. The example below shows the former method. Now, let’s demonstrate using GGPLOT2 to craft a visualization of this data, in layered steps. The goal is to make the graphic result potent with meaningful information without going overboard and producing clutter. This much produces the basic scatter plot (below left), with plotted points and some labelling. The diagonal green line indicates the barrier between winning(scoring more points than opponent) and losing(scoring less points than oopponent), in aggregate. In this plot, the better teams are located towards the ‘northeast’ quadrant while the worst teams reside in the ‘southwest’. 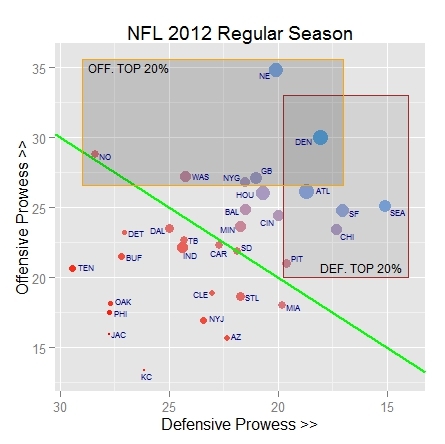 Notice that just one team, DEN, the Denver Broncos, resides in both the top Offensive 20% and the top Defensive 20%. Compare plotted points for two of the teams, NYG and IND, or the New York Giants and the Indianapolis Colts respectively (easier if you expand the graphic). The first can be thought of as an example of an under-achieving seasonal result, while the second can be seen as over-achieving. While the Giants have quite a good average Offense/Defense advantage, more than +5, the same figure for the Colts is an unimpressive -2. The Giants also are within the top 20% league leaders in Offense, and they eclipse the Colts’ seasonal defense totals as well. Yet, the Giants had only 9 victories (and missed the playoffs) while the Colts produced 10. Looking back at the original data helps to explain all this by revealing that two critical late-season games were lost by the Giants while they were still in the playoff hunt. These losses came with uncharacteristically wide score margins: 0-34 and 14-33, and both were at the hands of other eventual playoff qualifying teams. When the projected wins according to this function differs from the actual by about ±2, the swing is considered very significant, and can even be used predictively to forecast a rise or drop in wins for the following season. According to FO, this rule of thumb has generally been upheld, though of course other factors apply and can mediate the results. If on the other hand, the difference is less than ±1, it is considered meaningless. As can be seen below, all but 11 NFL teams fall within the meaningless range for 2012, whereas 4 teams bear special watching: DET, HOU, IND, and ATL. Of the four teams with ‘very’ significant differences between their actual and projected wins, only DET has underperformed based on their victory margins. The model suggests they are worth nearly 3 more victories than achieved. The other three teams, IND, ATL, and HOU are all projected to perform worse in the future. Note that the Pythagorean wins do not map evenly to forecasted win differentials for the following season; rather, a projected vs. actual differential of ±2 games is considered to map to about ±1 change in forecast wins. # How well does projected difference correlate to close game performance? In general, teams which have done poorly in close games have undershot their projected or Pythagorean wins. Perhaps only the Seattle Seahawks (SEA) stand out a little bit in this regard. Let’s finish up with an R scatter plot for this latest data. Along the horizontal axis is projected wins, while actual wins are plotted vertically. The broad red diagonal slope is where these two quantities would coincide, and only those 11 teams whose projected versus actual wins differ by at least ±1 are depicted. (The remaining teams, if plotted, would all cluster near the red diagonal.) Teams south of the red diagonal are underperformers, while those north are overachievers. The other diagonals indicate bands of disparities between projected and actual of ±1 (orange) and ±2 (brown) respectively. The color of the point is used to indicate the average offensive/defensive margin (POINTSF minus POINTSA) over the course of the season, where more blue means positive and more black means negative values. Finally, the size of each point shows the relative winning percentage for close games only. Visually, it’s interesting to compare two pairs of similar teams: MIN (Minnesota Vikings) with IND (Indianapolis Colts), and HOU (Houston Texans) with NYG (New York Giants). Taking the first two, both teams have identical wins (10), and their point sizes are very close, showing similar competency within close games: (.833 vs. .800). Yet IND has a much lower projected win amount, and therefore overperformed as compared to MIN. Why? It turns out that IND did poorly in blowouts — games decided by at least 20 points. They were 0-3 in such games while MIN was 1-0. Now let’s compare the other two teams. Both share very similar projections as can be seen from their X-axis positions. Also, both are identically colored, medium blue, indicating healthy average scoring margins: +5.3125. So what is the explanation for HOU having three more wins than NYG? Here, the size of the points tell the story. HOU fared much better in close games than did NYG; they were 5-0 as opposed to 3-4. 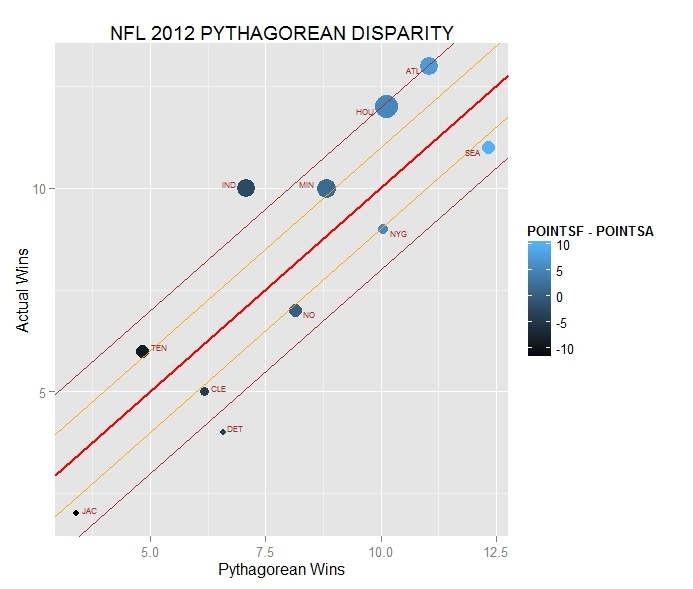 In summary, HOU significantly overperformed while NYG moderately underperformed, Pythagorean-wise. By stolzyblog in Featured, NFL Nerds, SQL Tips on May 2, 2015 .